Editors note: We often use this blog to highlight the wisdom and experience of those within our network. Isti Bardos is the Communications Director at Temple Israel in Memphis. On a recent webinar he was giving great advice to those getting started on Instagram, and we asked him to share some tips that make his Instagram efforts successful. A picture is worth…Yup. We all know. I would argue, however, that pictures – and videos – are worth much more than words, 1,000 or not. Imagery evokes feelings, creates empathy and fosters meaningful, lasting relationships. Isn’t that what our work in congregations is all about: building community and lasting relationships? By sharing highlights and snippets of everyday life through Instagram, you are illustrating how your congregation is a community of meaning and purpose, not only an institution with "tushes in seats". While some people may feel nervous about showing photos of people in your congregation, Instagram (and the sharing culture) is happening with or without you. Be thoughtful about releases in your membership and registration materials (and avoid those who don't want their photos shared), but also recognize that many of the ever-so-coveted 20s/30s demographic are prolifically sharing their photos (and wanting to see those of others). A full 90% of those using Instagram are 35 or younger (data as of June, 2015 — older demographics are beginning to flock to Instagram too). 1) It's in your congregation’s best interests to put your best face – literally and figuratively — out there! 2) Participating in Instagram a way to “show off” your congregation. 3) It's good to show a wide array of smiling faces, activities, and slices of life of your congregation! 4) By using Instagram, your congregation will be perceived as hip and modern, on top of the newest technologies. 1) What should we post? 2) How often should we post? To me, the answers are the same: Post good content when you have it. But make a point of integrating great photography (on your phone!) into your routine so you have content at least a couple times a week. So, simply take a photo of a smiling child at religious school. While the culture of Instagram is to post photos immediately after they are taken, you can also have some "timeless" images that can be saved for a Friday post. With these #ShabbatShalom postings, you will be sharing a photo at least once a week! Another example which could guarantee another weekly post, is #tbt. #tbt stands for “throwback Thursday.” It’s simply an easy way for you to post a video or photo of something that happened in the past, whether it was a year or 100 years ago. This could be a childhood photo of your rabbi, or a memorable event in your congregation's past, like this picture from our congregation's 2008 trip to Israel. 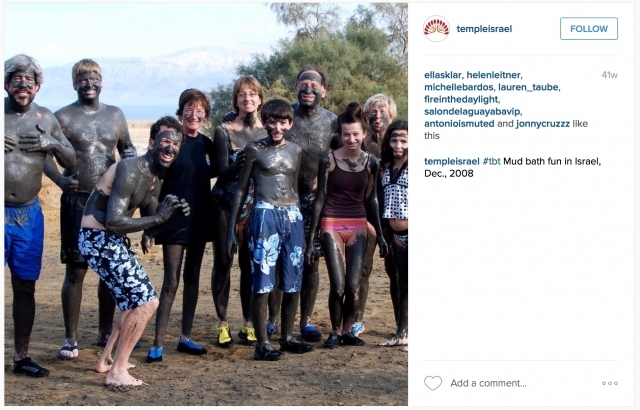 So between #ShabbatShalom and #tbt, you already have guaranteed yourself at least two compelling Instagram posts a week, which a great start! By the way, it’s important to use photo of people who are smiling, because smiling… is a cause of happy feelings! …is contagious! …can make you healthier! …can be a predictor of how long you’ll live! But also remember that Instagram's community values really great photography, including abstract shots of mundane things, insights into everyday moments, bold color and gorgeous patterns. 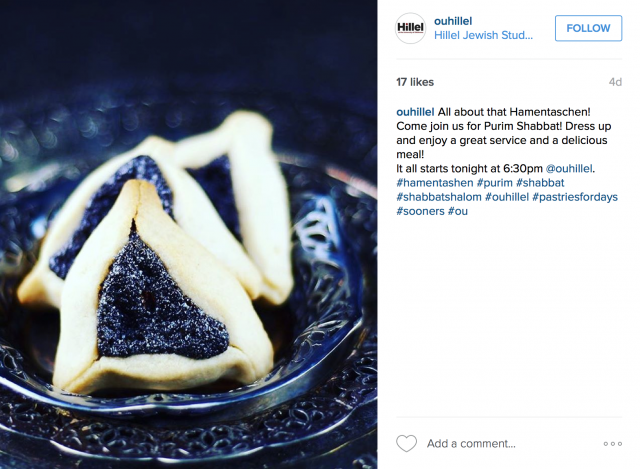 Like this photo of Hamentashen from OU Hillel. Also, there is a sense of immediacy and connectivity with Instagram. For example, what is more interesting and interactive: reading – a month after the fact in a black and white newsletter – the sentence “Students watched a science demonstration involving Mentos and Diet Coke” or watching a 10-second video clip of a “volcano” erupting a few minutes after the event took place – and then having the ability to provide immediate feedback? Posting photos and videos to Instagram is less about the information and more about making emotional connections. As people scroll through their Instagram feed, make sure that your congregation has a presence! Scroll through your Instagram feed periodically to see the "bigger picture" that new followers might find if they look at everything you've posted recently. If your congregation doesn’t use Instagram, start using it today. If you have an Instagram account, step your game up! After all, if your congregation REALLY IS a vibrant, warm and welcoming congregational family, then SHOW IT! Isti Bardos is Communications Director at Temple Israel in Memphis, Tennessee. 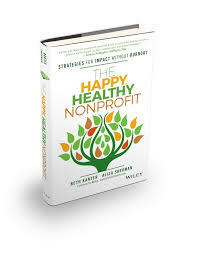 Have you been to the Nonprofit Technology Conference? No? Oh boy, you've gotta come. It's a gathering of about 2000 of the country's most interesting do-gooders who use technology in any part of their work — from marketing and communications, to fundraising, to data management, and innovative leadership for cutting edge organizations. Each year, we gather the Jews at NTCjews — many who work for Jewish organizations, and some who are Jewish and work for other organizations. We share knowledge and experience, learn together, eat together and strengthen our network for support and inspiration year around. We love bringing people from Jewish organizations here to learn about the best of what's happening across the nonprofit field. This year NTC is March 23-25, 2016 in San Jose, California. You should come! If you're interested in learning more about what we're doing there (learning sessions, networking, dinner together, Purim celebration) drop your name and email in the form below so we can make sure to keep you updated. “We need to be reaching more people.” The constant refrain we hear from organizations that believe they have something valuable that the world should be paying more attention to. It’s true. But we’re living in an attention economy, where everyone is so flooded with messages, content and noise that all we want to do is filter it out. Yes, we need to be reaching more people. But to do that, we need strategies to break through the clutter and penetrate people’s eyes, ears, hearts and minds. It’s important to understand three different approaches to get seen and heard, and then to determine what mix is going to help you achieve your goals. The trifecta: owned, earned, and paid media. Owned media includes the channels you have created, and the content that you own. This might be content on your website and your blog. It also includes your Facebook page, YouTube channel, Twitter accounts and other social media channels. A great approach to owned media requires creating strong content and having a strong social strategy to back is up and leverage the time you put into creating that content. If you’re looking to mature your owned content strategy, read up on the practices of “content marketing” and “multi-channel strategies." Paid media is, simply, media exposure you pay for. Google AdWords, Facebook advertising, SEO campaigns and other opportunities to pay to get your content showing up in more places. Smart paid media is surgical in its focus – you don’t want to be paying for Google to serve up your ad to the wrong populations – and the content itself needs to have compelling calls to action to even get audiences to engage. While “digital marketing” and “paid media” used to be synonymous, they are no longer. Paid media may still have its place, but in today’s attention economy, people are much more likely to listen to the recommendations of their friends and to allocate their attention to brands they trust and already have a relationship with in some way. Between owned, earned and paid, I would argue that earned media is the most valuable of all. Earned media is when other people, channels and sometimes even brands are talking about you and/or sharing your work and messages. Hopefully these mentions are good. But a bad Yelp review, for example, is also “earned media”. Earned media often is a mention or review of your work, but it can also look like an interview on someone’s blog or a guest blog post where you’re work appears on someone else’s blog. Earned media is related to other forms of media. When someone shares or amplifies your content on Facebook or posts a link to your blog on Twitter it’s because you did a good job with your owned media. You may use paid media to increase exposure which then helps people pick up on it and share it, tipping into the earned media category. The benefit of earned media is that it piggybacks your brand on the brand equity of the person or brand that’s sharing it. The hard part of earned media is that you have to earn it. You have less control than owned media (where you create and manage it) or paid media (where you decide what’s worth paying for an how much). What you give up in control however, you gain in other ways, as earned media has greater trustworthiness and authenticity, and can extend to entirely new audiences you otherwise would never be able to reach. Any smart content strategy includes owned, paid and earned media. I find, however, that many organizations neglect to pay enough attention to earned media, or to really work for it. Some earned media happens by good old fashion luck, but there’s much you can do to cultivate opportunities. Identify the brands, people and influencers whose channels would be valuable to you. It might be about scale, relevance, audience, or adding the character of their brand to yours. Build relationships with them. Follow them on Twitter, share their content, comment in their channels to add value for them and their audiences. Listen and learn what’s authentic to their audience. Notice where they are offering earned media to others (mentions of other projects, guest blog posts, what they retweet and share). You need to fit into their culture and brand identity – having insight will help you thread that needle. Create content worth sharing. It should be valuable, and add to the social capital of those whom you want to share it. It can be really useful or really funny. Top 10 lists, infographics and well produced videos travel well too. Don’t forget to include share buttons on your owned media to make it easy for people to share it! Use content creation as an engagement strategy. When you’ve told a story or thanked someone in your content, a natural next step is to let them know through social media, which will likely encourage them to share it. Use your relationships with others to find guest blogging opportunities (and offer them in return as well). Make sure to position yourself as adding value to their community, not only trying to self promote. Do a good job and you’ll likely be invited back. How else have you earned your earned media? What people, channels or brands have given you an important boost? This post is cross posted on the See3 Communications blog. – Virginia Heffernan, "Magic and Loss: The Pleasures of the Internet"
Transparency itself isn’t a new concept. In the US for example, nonprofits must publicly file 990s annually. This ensures accountability, and is a requisite for tax-exempt status. But transparency does not begin and end with financial information. There are new dimensions, new imperatives emerging from technology, and perhaps most profoundly, transparency is now a critical leadership skill. That feels pretty new to many of us. But today’s leaders need to understand that transparency is no longer optional. When the rules of the game have changed, leaders necessarily need to adapt their approaches. What roles does transparency play here? According to Charlene Li, author of Open Leadership, “transparency is not defined by you as a leader, but by the people you want to trust you and your organization. How much information do they need in order to follow you, trust you with their money or business?” (pg. 193). It’s all about trust — and trust (and its corollary, attention) are the currency of our current attention economy. Understanding that transparency is a critical value and essential element of effective leadership has powerful implications for organizational sustainability too. Previously, organizations literally served an ‘organizing’ function. Institutions held the data, finances and authority. Today, individuals are self-organizing and shifting the power center. Jeremy Heimans and Henry Timms decode this in their HBR article “Understanding ‘New Power’”. Simply, “the goal with new power is not to hoard it but to channel it.” As society is increasingly skeptical and rejecting of old structures, transparency becomes even more important. It becomes a way to activate and channel new power. Some people mistake transparency for cracking open your financials and letting it all hang out. But it isn’t just about opening up your books or making leaders function as if they are naked. Transparency (of any sort) is values-based, centered on respect (hakavod), virtues (middot), and, the big one, truth (emet). Think about your relationships with your spouse, business partners, and good friends. Yes, there’s the planning — taking kids to soccer, paying the bills, making doctors appointments. But what if you didn’t trust your partner, and had little input in decisions? The logistics would be joyless. Strong relationships are built on respect, honesty and open communication (transparency). So too relationships with our donors, members, volunteers and advocates. Jed Miller, who helps human rights organizations align mission and digital strategy, says that “Institutions may be afraid that by opening up about internal processes they give critics a map of their weak spots.” He warns that this kind of initial fear is inherently limiting. “The key,” he says, “is to think about your public—however you define them—as participants in your mission, not as targets or threats.” What kind of insight — into processes, decision making, etc. — is needed for them to trust you as a champion of the cause? When we, as leaders in the Jewish world, hold ourselves and our leadership apart from the community, how can we expect to engage our communities with full and sanguine spirit? We cannot hide or disable conversations, or operate in a vacuum and expect the public to consistently trust us with their dollars. Those days are over. Today, we need to embrace these values of open leadership. Organizational transparency is where Jewish wisdom nests with innovative thought. I’ve spoken to rabbis about salary transparency, and searched Jewish orgs with high ratings on charitable indices. Comparing synagogue websites, I’ve sought open plans, board minutes and budget spreadsheets. While there are bright spots, the norm is much more closed and opaque. In the Jewish professional community, we tend to compare ourselves to each other to establish a norm, when in fact we need to be widening our gaze to understand the role and importance of transparency in today’s marketplace. My sense is that the Jewish world is not keeping up, or worse, we are not pushing ourselves forward. It is time that we recognize the shifting norms, acknowledge the benefit to our organizations and community as a whole, and take real steps to integrate transparency into our normative business practices. In a time when many Jewish organizations are seeking to get more people to trust and follow them, we must heed Open Leadership author Charlene Li’s words of wisdom. Transparency is the information people need in order to follow and trust you as a leader, or as an organization. While leaders may be initially resistant to the idea of transparency, we must all take it seriously to build strong, sustainable and vibrant communities. Stay tuned for future posts on specific examples of how various leaders are putting this ethos into action. Gina Schmeling is a non-profit consultant based in Brooklyn. Find her at @nyginaschmeling or in the park with the runners. Of the many inspiring Passover messages that I read this year, the one that most caught my eye was by Rabbi Jill Jacobs,"Where Slavery Ends and Freedom Starts. ", March 30, 2015. Rabbi Jacobs, Executive Director of T’ruah: The Rabbinic Call for Human Rights, shares "it's not always so clear where slavery ends and freedom starts. Did the Israelites become Pharaoh’s slaves only after he set taskmasters over them? Or did we lose our freedom when we became dependent on Egypt’s largesse? Did we become free when we crossed the sea, or only when we established a homeland of our own? … The line between slavery and freedom is not always clearly marked by a parting sea." Rabbi Jacobs applies this to the context of oppressed workers in the modern economy, people who are bound not by shackles and chains but by poverty, fear, emotional abuse, or lack of education. Freedom is not only about our physical reality, but also our mindset. Even while the Israelites were physically free, they reminisced that “in the land of Egypt, when we sat by pots of meat, when we ate bread to our fill!” (Exodus 16:3). It’s hard to let go of what we know, what’s our “normal” even if it’s not ideal, or even serving our interests. People (and collectively, organizations) who think they are “free” can also be “enslaved” by old ideas and ingrained patterns of behavior. Whenever we keep doing things in a certain way because that is the only way we’ve know to do them, we run the risk of self-enslavement. This is especially true when the old ways aren't working anymore, and the need for change is increasingly clear. Let’s look at this in three areas of American Jewish congregational life. For a hundred years or so, most American synagogues have been organized with a dues-based membership model. This model has been nearly universally adopted, and the norm for multiple generations — such that, just like in Egypt, it’s hard to imagine any other way. But today there is abundant evidence that this model isn't working as well or reliably as it used to for many congregations. There are, however variations, changes, and new and different models that some are successfully utilizing. While different synagogues may need different approaches designing how their communities support them, across the field we are starting to feel the questioning and active pushback that are hallmarks of a new kind of freedom to explore different kinds of synagogue funding models. Most American synagogues have also shared the idea that if we build the biggest building, create the best programs, boast the most creative religious school, and hire the right rabbi, then the Jews will come running to become members. But for Americans today (and especially for younger generations), the whole notion of membership (to any organization) doesn't seem quite so certain or resonant. Those of us who do care about our synagogues, who do find meaning, purpose, and connection in this kind of social and religious organization have to find new ways to make other people see that value and spark, and to care too. That means seeking out, creating, and experimenting with variations, changes, and new and different models of engagement. Too often our mindset is that “engagement” equals “membership” and “attendance”, but engagement is as much about a mindset and relationships as it is about attendance. Here too, let’s free ourselves of assumptions about our engagement models, and explore a new normal. Most American synagogues rely on boards and committees, volunteers, lay leaders, and professional staff who spend hours and hours in meetings and parking lots making important and not-so important decisions, and then making them again on phone calls and in more meetings. We struggle to find new leaders and new volunteers in part because our current leaders are feeling over-burdened, and in part because the structures of our leadership (multi-hour meetings on weeknights that conflict with kids’ activities, sports games, and other interests) are out of synch with the ways prospective leaders organize their time and attention. What if, just what if, we ask ourselves to consider variations, changes and new and different models of leadership? Remember when Yitro, Moses’ father-in-law, pushes him to think differently? “'The thing you are doing is not right; you will surely wear yourself out, and these people as well. For the task is too heavy for you; you cannot do it alone" (Exodus 18:17). Let’s free ourselves of these structures, and instead look afresh at what makes the most sense for our needs today. As we count the omer and move from a celebration of the exodus to the receiving of the Torah, may be take the opportunity to recognize, with 20/20 vision, the places where we may be limiting ourselves, even “enslaving” ourselves to old ideas and previous models that are no longer in our best interests. As the Israelites wandered the desert, there were many questions, few clear answers, and plenty of “figuring it out as they went”. So too are congregations today in a time of pioneering a new era. Let us embrace the questions, explore possibilities, and be free to pioneer the future. This blog post is cross posted on the Connected Congregations website. Learn more about Connected Congregations here. Debbie Joseph is president and founder of Debbie Joseph Consulting, Inc. She is a nationally recognized expert in working with synagogues on exploring alternative dues and membership models, strategic planning and leadership development. She is a contributor to UJA-Federation of New York’s “Are Voluntary Dues Right for Your Synagogue?” report and a contributor to “New Membership and Financial Alternatives for the American Synagogue” by Rabbi Kerry M. Olitzky and Rabbi Avi S. Olitzky. What Do We Mean By “Capacity Building”? Posted on April 7, 2015 by Author Lisa Colton Leave a comment on What Do We Mean By “Capacity Building”? We work on capacity building for organizations seeking to align their organization with the revolution in modern communications. In fact, we think this is so important that it has become a central part of all of our consulting work and this work on capacity gives the best long-term ROI of any activities we can do. But what do we actually mean by capacity building? What does capacity mean in the context of a nonprofit organization? All of us are overwhelmed every day by articles, blogs posts, slide presentations, emails and workshops that focus on the tactics of communication. Whether it is about image size or frequency of posting on Facebook, or whether Pinterest is worth investing in, or the top donation page design, there is no shortage of information about the latest thinking in digital communications tactics. And while this information is useful —it is not the central difference between those who win online and those who think they could be doing a lot better. It is hard to absorb all that information and rarely do we see the information we need when we most need it. Overlooked in all of this advice is the capacity of organizations to make use of it, to integrate it into their plans and to see the bigger picture about how tactics ladder-up as part of strategy. When we talk about capacity, we mean PPTC, which stands for People, Process, Technology and Culture. In order to have the capacity to be effective, you need to align these four areas of your operations. Once aligned you don’t need to sweat the tactics because they naturally flow into the organization through the people paying attention, the continuing improvement in process and the technology you’ve adopted to get the job done. Having your 20-something office admin who loves SnapChat does not mean you have capacity to succeed with social media. The people who can do a particular body of work are critical and it is almost never one person. Your whole team needs to understand how digital communications is part of a “theory of influence” that moves your issues forward. An important rule of thumb: don’t let front-line staff make business decisions on the fly. Imagine, for example, you have a crisis and this needs to be communicated. The young intern who knows how to use social media would be great to post things and respond to people asking questions — but only if the leadership decided what to say, how to say it and how to navigate the minefields and nuance of the story. Bottom line: When we talk about People and capacity, we mean the whole organization understanding the principles behind these new digital communications tools and being able to give organizational leadership on the approach. And we mean having strong, technically savvy front-line staff able to execute and understand tactical best practices and analytics. While “rock stars” can have a lot of success with heroic efforts — all nighters, last minute deadlines, a brilliant idea — it does not represent capacity. Capacity is about enabling the same high quality results over and over again. And this consistency of results can’t be achieved without process. Process sets a baseline where we ask the same questions, have check-lists and a well-honed step-by-step approach. The content changes, but the process remains consistent. The process also has a built-in feedback loop for continual improvement. What worked on this campaign? How can we do better? We ask these questions every day and when we find ways in which the process can get improved, the improvements get incorporated. Nonprofit communications and operations require technology. Technology is used from the basic — can we answer the phones? — to the complex — can we share data between online and offline donors? Having technology that is aligned with the business goals is an important part of capacity. Sometimes, organizations are spending far too much money on technology that has marginal benefit and not enough on technologies that are core to the long-term vision of success. For example, there is simply no way to treat your donors and constituents as individuals without technology that allows you to monitor, track and be able to respond to them individually. If your content management system doesn’t allow for updating critical content in a timely way, you have a business problem. In the world of dominant digital communications, this technology is critical. For many consultants, they don’t see culture as a capacity issue, but we do. In fact, we think it’s the most important one. In many ways, the people, process and technology are a prisoner to the organizational culture. A culture that is old-school and slow, timid in its approach to communications, and where employees fear risk and failure will never be a top performer in digital communications. They can hire the best people, publish books of standard operating procedures, and buy top-of-the-line technology and it won’t do them any good. The new initiatives will collapse under the weight of an outdated culture. But how, you might ask, can we influence culture? We’ve given that a lot of thought and field testing. For us, it’s similar to the military counterinsurgency “oil spot” theory. In this approach, the military seeks to hold a small territory, build trust and commitment there, and then build out from those strengths until it encompasses the whole town or society. Similarly, we focus on the design and implementation of strategic projects whose often unstated purpose is to create new pockets of culture inside an organization. Often, we label these projects as experiments, which takes the pressure off of them and allows for a greater range of action. These pockets of new culture energize the organization and become a magnet for people wanting to get involved and other internal investments. The follow-on projects bring the culture change to more people internally and eventually, it’s the tail of the new culture wagging the dog of the old organization. Culture change also benefits greatly from leadership buy-in and the bully pulpit that encourages a set of new values, such as taking risk and failing fast. But we cannot overstate the challenge of bureaucratic silos, where incentives are aligned against change and cross department projects are the exception. The bottom line is that if you really want to win in digital communications, if you really want to become high performing and raise more money, if you want your cause to be one that people rally around, you have to go headlong into the complex world of organizational culture. Portions of this blog were cross posted on the See3 blog. See3 Communications and Darim Online presented a one-day intensive Social Media Boot Camp at the Leichtag Foundation Ranch, to help over 70 representatives from a very diverse collection of local Jewish communal organizations learn about the social media landscape and develop specific skills to advance their work. The following are resources from the September 15, 2014 event.